Summary: A local college has gone to the dogs -- and cats -- by permitting them in on-campus housing. Station: KDKA Channel 2 Reporter: John Cater When it Aired: Sept. 4 Running Time: 1 minute, 59 seconds Visuals: * Idyllic campus scenes from the Washington & Jefferson College in Washington, Pa. * A sophomore walking her white, fluffy lapdog. Highlights: * When Cater submits, "September means classes are in session ... but as students are welcomed back, so too, are a few of their four-legged friends who are actually allowed to live with them in campus housing." * When a female sophomore (with a fluffy, white dog panting heavily on her lap) says, "I love it ... I'm not as homesick as I was last year. It's nice having him here to cuddle with at night.'" * When Cater informs, "Nestled right in the middle of dormitory row sits the college's Monroe Hall, now also known as the 'pet house.' This is where students and their pets are permitted." * When the assistant director of residence life says, "We started it last year as a pilot, and it was so successful that this year we invited all those pets back and actually made some offers to first-year students, freshman coming in, so they could bring their pets from home, and they're really excited and we're hoping this year will go just as well." * When another female waxes sentimental about her cat, Chloe: "She's my world. I'd have to say my best friend. Like she's, honest to God, the only person -- well, she's not really a person, but -- the only, I guess you'd say animal, that I've ever had that has ever treated me as if I was really, really important." * When Cater updates, "So far the dormitory has just four dogs and four cats, but we're told there's room for more." * When our fluffy, white lapdog owner assesses, "[I]t's great. The animals get along. ... [I]t smells better than half the dorms here probably, because people actually take better care of them in here." What We Learned: At $50 a year to keep your cat or dog on campus, this may be the best bargain college has to offer these days. Unanswered Question: When are other colleges going to catch on? News Value: 7. While I am often critical of people who dote on animals excessively -- and the stories that glamorize the trend -- this is one instance where I can see some terrific benefits. Not just safety, but I'd bet that having your pet while you're away at school can improve your quality of life, and maybe even your grades. Summary: The latest monkey wrench in building a Flight 93 Memorial -- a potentially poisonous substance on the site. 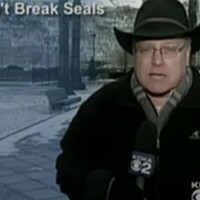 Station: WPXI Channel 11 Reporter: Scott MacFarlane, live from Washington, D.C. When it Aired: Sept. 7 Running Time: 1 minute, 50 seconds Visuals: * MacFarlane outside the Capitol. * The caption, "Only on 11." * Drawings of the monument. Highlights: * When MacFarlane gives us the low-down: "[T]hat toxic substance is called manganese, and I'm told the National Park Service will not complete or open the monument until the toxic substance is completely treated. And there are fears here tonight that clean-up won't happen anytime soon." * When he continues, "We've seen the sketches and drawings: Designers of the Flight 93 Memorial are planning an historic monument in Somerset County, surrounding what's called the 'sacred ground,' the final resting place of the men and women on board. But state environmental officials tell us [that] on the sacred ground, and surrounding it, is manganese, a byproduct of a coal mine that sat here when the plane crashed." * When he adds, "Pennsylvania officials tell me the coal company is trying to clean up the manganese, but they're having trouble because they can't and won't dig up the sacred ground where the remains lie. A state official tells me as of tonight, there's no consensus on how to complete the treatment or how to pay for it all." * When Rep. Bill Shuster (R-Somerset) asserts, "Because of the bureaucratic red tape you see here ... that's going to be highly insulting not only to the people in Shanksville, but more importantly to the families of the flight and crew of Flight 93." * When MacFarlane adds, "Congressman Shuster wants the ... federal government to waive the rules. He says manganese is no threat to the health or safety of anybody who visited the Flight 93 Memorial." What We Learned: That it's insult on top of injury for family and loved ones of Flight 93 victims. Unanswered Question: What are the risks associated with exposure to manganese? News Value: 8. Another unfortunate setback for supporters of the monument. But this piece is a great lesson in bureaucracy. Not surprisingly, it was done by an enterprise reporter, not a WPXI staff member.